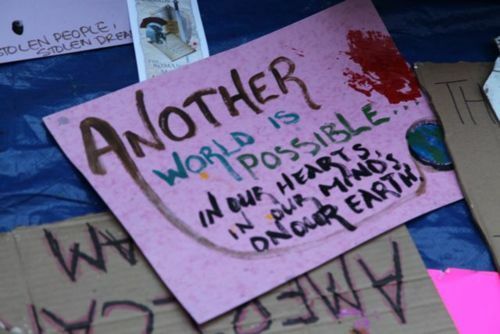 Home > Latest News > Occupy the Present Moment! Here’s a lovely submission from Maia Duerr. Thank you! I spent this morning at Occupy Santa Fe. Among the hundreds of people who were there to march to the Round House (our capital building) and then peacefully assembled on the lawn there, about 15 of us offered a meditative presence. This was the first “official” Liberated Life Project event, cooked up with a number of people from my spiritual home, Upaya Zen Center, as well as other kindred spirits who joined us. Our banner read, “Occupy the Present Moment.” And we had a great time. Based on everything I saw this morning in Santa Fe and have heard coming out of NYC and other parts of the world (with the exception, perhaps, of Rome where things got violent), chances of success are looking very good. This is perhaps the only major demonstration I’ve been part of (and I’ve been in dozens, centered on issues like labor rights, ending the war in Iraq, and nuclear disarmament) where our meditation actually felt a bit redundant. Certainly not unnecessary, because everyone who took part in it expressed appreciation for a space in which to find our center and return to our breath. But redundant in the sense that among the larger crowd we were part of, everyone had already tuned in to a vibe of peacefulness, joy, and nonviolence. It became abundantly clear to me that this movement is based in a real honor and respect for kindness, for making sure every voice is heard, and that needs are addressed as best as possible. “Our strategy should be not only to confront empire, but to lay siege to it. To deprive it of oxygen. To shame it. To mock it. With our art, our music, our literature, our stubbornness, our joy, our brilliance, our sheer relentlessness — and our ability to tell our own stories. Stories that are different from the ones we’re being brainwashed to believe. The corporate revolution will collapse if we refuse to buy what they are selling — their ideas, their version of history, their wars, their weapons, their notion of inevitability. This collective of people — all around the globe — is remembering that truth. We’re waking up to it, to use a Buddhist phrase. We are changing the story… we are no longer believing that we are beholden to corporations, but rather to each other. We are creating rather than merely consuming. Something magical is happening here… it’s impossible to say where this will all lead, but keep an eye on it, for sure. And better yet, get involved. I, for one, am headed back there right now. I hear Food, Not Bombs, will be serving dinner to the crowd.